ASIAN NATIONALISM: Japanese Nationalism - Old News or New Worry? WHAT WE FILIPINOS SHOULD KNOW: There are amongst us who claim to be "internationalists" or "globalists" and thus, like the proponents of economic globalization, mouth its anti-national sovereignty line to belittle Filipino nationalism and to claim its obsolescence or anachronism. As in the past and the present, the reality is that throughout much of the world nationalism have and will always be alive, as evidenced through acts of economic protectionism, historical revisionism, to simple flag-waiving, etc. by nation-states. Whether we talk about the former communist USSR which was then composed of suppressed satellite states, now independent nation-states; or the mutually cooperative but still independent nation-states within the European Union (EU). Whether we talk of the United States, although in this case it is more appropriately a case of ultra-nationalism or imperialism as America for more than a century continually projects and works to redefine, rationalize, maintain and expand its so-called "national interests," i.e. mainly economic and military, well beyond its borders. Thus, for Japan to become more demonstrative of its repressed nationalism, is natural. Since Nationalism is as real as human nature. 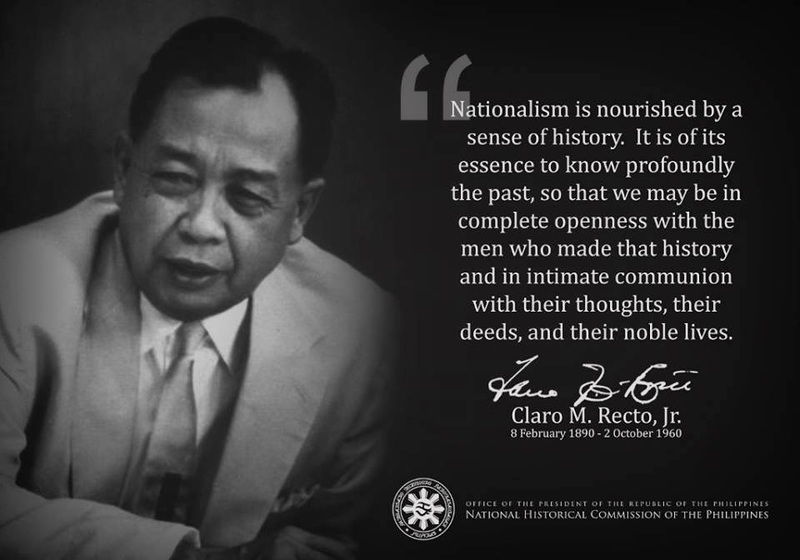 It seems that only we Filipinos, especially as exhibited by us the so-called educated who ought to know more than "the people", "the taong masa," the ignorant mass we love to blame everytime, are not as nationalistic. We the so-called educated ones, unquestioningly prefer, gladly ape, and enthusiastically default for Americanism. For the past 60 years since our so-called independence, we have religiously done so, without much thought nor hesitance, following and trying to please our former occupier and master America, but still not earning its respect and instead taken everytime for granted, and look at what we got to show to others and ourselves. When are we going to wake up? When are we going to be Filipino nationalists, to "look up for #1", to think and struggle first for ourselves as malay Filipinos, and to fight for the betterment of our next generations of native, malay Filipinos, christians and muslims? Below an article on the resurgence of Japanese nationalism, albeit militant, which has been laid aside by post-WW2 American occupation of the country; and despite the American-imposed reformation of Japan into a strongly pro-American "showcase of democracy." Japanese Nationalism: Old News or New Worry? As nationalism In his "Notes on Nationalism," George Orwell writes, "the nationalist not only does not disapprove of atrocities committed by his own side, but he has a remarkable capacity for not even hearing about them." For nearly the first half of the 20th century, nations around the Pacific lived in fear of Japan's formidable military machine and regional hegemonic pretensions. In the latter half, they dreaded a return of unconstrained and aggressive Japanese power.Japan's unwillingness to address in some broad cathartic manner the cruelty of its wartime deeds has kept the specter of Japan's empowerment as a rearmed "normal nation" something that many Asia-Pacific citizens feared more than welcomed. Many observers today--including Eugene Matthews, a former senior fellow at the Council on Foreign Relations who is now president of international educational firm Nintai--argue that Japan's trademark pacifism is being supplanted by a new robust nationalism, and that Washington and the world need to adjust to both the opportunities and problems of this trend. Matthews made these points in an important essay titled "Japan's New Nationalism" in the November/December 2003 edition of Foreign Affairs. It is true that Japan's nationalism is becoming more evident and obvious to the world. What is not clear, however, is if Japan's nationalism is a new phenomenon, or if the rest of the world is only now awakening to a Japanese nationalism that has been brewing for decades, if not longer. What is misunderstood is that Japan, even in its most strident moments of extreme pacifism, has had a strongly nationalistic citizenry, struggling with a deep need to be unique and powerful and to matter in the world. What should concern observers now is not a supposedly new Japanese nationalism but rather the radicalization of an otherwise stable and healthy Japanese nationalism that increasingly resents the ongoing subordination of its sovereignty and interests to its former conqueror and Cold War ally, the United States. Current discussions on Japan's nationalism often engage in a shallow and intellectually thin treatment of the subject, overlooking deeper questions: What is nationalism? When does one see it? When does one not? Mr. Matthews suggests that Japan's sinking of a North Korean fishing vessel in December 2001--quite possibly a spy ship or covert smuggling operation--is evidence of a new nationalism in Japan. Others point to Japan's launch of a fleet of self-built spy satellites and its willingness to send material, ships and Self-Defense Forces troops abroad for contingencies far beyond its borders as manifestations of a nation that is ready to cast off past constraints on its military role and identity. In addition, nearly all who comment on Japan's new nationalism point to the now cliched, saber-rattling spear-carrier for unconstrained and crude nationalism, Tokyo Gov. Shintaro Ishihara. Ishihara is important, but he is not new. What has recently brought Japanese nationalism to the fore has more to do with American presumptions about how the Japanese should feel about their own interests and circumstances than it does with the strong and ubiquitous nationalistic currents that have long been agitating Japan's national character. During the first Gulf War, Americans convinced themselves that Japan should be as worried about Saddam Hussein's invasion of Kuwait because of Japan's dependence on Middle East oil. But Japan's national ambivalence in that conflict rested on Japanese confidence that its ability to buy oil from Iraq and other Middle Eastern nations would not be undermined. The answer to the future of radical, rather than sensible, Japanese nationalism depends on the manner in which the United States responds to Japan, North (and South) Korea and China. The terrorism unleashed in Washington, New York and Pennsylvania on Sept. 11, 2001 deeply buried any illusions of runaway globalization and the end of the nation-state. After 9/11, U.S. President George W. Bush demanded loyalty oaths and clear declarations from leaders around the world on which side--America's or the terrorists'--they chose to be. Unlikely nations such as Libya, Sudan, China, Russia, Yemen and even Syria chose to side with America. After 9/11, borderlessness belonged to transnational terrorists who thrive in dozens of languages and scores of nations despite a hostile intelligence environment. In response, America led the way among all nations reasserting its security priorities, bolstering borders, impeding the flow of people and investment, reversing globalization and reestablishing the nation state as the primary fixture of 21st-century global order.Thus Japan's nationalism, brewing for decades beneath a cosmetic veil of pacifism, seems to be going with the flow of the return of the nation-state. It would be incorrect to argue that Japan's recent nationalistic flirtations have anything to do with 9/11. If there has been any impact at all, 9/11 has only helped to slightly accelerate a trend that was already well under way. Japan has not rushed into a role of global military activism despite sinking a mystery ship, despite passing temporary anti-terrorism legislation, and despite passing legislation permitting Prime Minister Junichiro Koizumi to send about 1,000 SDF troops to help stabilize post-Saddam Iraq--each of which is a relatively small-scale, low-cost arrangement, far more trivial than the 13.5 billion dollars financial contribution Japan made in the first Gulf War. Japan was in fact the only nation on the planet that directly taxed its people to pay for removing Saddam Hussein from Kuwait. Japan's prime minister is skilled at manipulating symbols of a Japan empowered on the world stage: intelligence briefings at Bush's Crawford ranch, and a fairly quick response to U.S. Deputy Secretary of State Richard Armitage's admonition to "show the flag" after Japan sought direction from the United States in how to respond to the 9/11 tragedy. But the bottom line for Japan's actions is that they continue to be militarily small--trivial, in fact, when it comes to a substantive contribution to stabilizing Iraq. Whether or not Matthews is right about the time line, he is correct that nationalism is no longer hiding in Japan, as it is not in many other nations. America needs to be sure that it uses its power and influence to permit the healthy development of national identity and nationalism in Japan, stepping back and reducing American over-extension in Japan and in Asia. Japan needs a new constitution. It needs to figure out a way to participate in both military and civil society-building excursions around the world. In fact, it largely already has. In many ways, Japan's civil society-building competencies are far more developed than America's. The combination of Japan's desire to be more self-governing combined with a United States that on the one hand applauds Japan's emergence as a military power and at the same time recognizes fears in Asia about Japan's increasing military power is a toxic mixture. America has not and should not snuff out the natural evolution of Japan's nationalism. America cannot be the cork in the bottle, but its attempt to be such will radicalize many Japanese. Instead of the advocate for American interests and power Koizumi has turned out to be, the United States may face in the future a slew of prime ministers whose legitimacy is determined by the intensity of their anti-Americanism. Steven Clemons is executive vice president of the New America Foundation, a centrist policy institution in Washington. for TODAY is a dangerous commodity. Your statements so far are more general, if not nebulous, as to where you really stand or what you believe, than what I have ranted/written about in my blogs. Does one have to be 'Malay' to be a Filipino? If so, what about the Negritos, and other minorities and mixed races in the Philippines? I think and believe all ethnic minorities in all Regions 1 to 8 (if I remember right or as you mentioned/implied) in the Philippines are Filipinos, they comprise about 10-20% depending on one's source of data. Majority of us are, of course, malayan. to pay off the congressmen as before). But I think and believe they only do so for convenience. Since they simply do not want to socially assimilate with the natives (am not referring to plain business interactions); and I suspect where their sentiments are then and especially now that mainland China has become a world power, economically and therefore politically. With a growing foreign presence, our homeland can possibly become a sort of China during the 1900s when foreigners with their troops defeated the rebelling Chinese (Boxer rebellion); and where essentially these foreigners (Europeans, Americans, Japanese)thereafter parcelled the mainland into their respective areas of influences, economically and politically. It's only when Chinese nationalism grew via leaders such as Sun Yat Sen, then Chiang kai Shek and later Mao Tse Tung that the mainland/native Chinese able to unite and drive out their foreign exploiters. My thoughts/concerns are not due to unreasonable hatred/fear of foreigners(xenophobia). Because it is based on past and present realities in the homeland. If one has lived there for at least several decades and also studied our society; one will deeply appreciate it. Again of course as you may know, why our present socio-economic situation became so is mainly due to us, i.e. through our representatives in government, who are supposedly in the know and who can do something about it, but did not. Kindly note the reply of one of my Filipino friends. Your friend's argument already implies that the Malay Filipino is a dying species, to be overwhelmed in the next century with Chinese and other mixed races calling themselves 'Filipinos'. Other than that, he has not really answered our question: Does one have to be of Malay race to be a Filipino? the first true global citizen of the world if you like. Perhaps our problems in some parts of the Philippines today is that we continue to divide ourselves into Malay, Spanish, American, Chinese, Negritos, Muslim, Christian, Hindu, Jewish, Buddist and all that jazz. I believe your friend's idea of identifying himself as a staunchly one-eyed Malay Filipino is from a dying breed,screaming for survival as he heads into the Black Hole. I am glad to hear that you do believe that all ethnic minorities in the Philippines are Filipinos, as they comprise a mathmatical 10-20%. Would you happen to know what percentage Majority are Malayans? naturalized after the Marcos 1973 Constitution. At the time William was taking up Chemical Engineering at the University of the Philippines, and had requested his Filipino classmate at the UP to also be a character witness. Would you say that William and his brother did not want to assimilate with the natives? Let me say that William is not only a good, law abiding Filipino. takes thetime and trouble to visit his sick classmates and former teachers. He does a lot of the corporal works of mercy for the poor and less fortunate brother Filipinos. He has visited the ancestral home of his grandfather in China. Would you say this would make him less of a Filipino? Humaba rin ang sagot ko. who happens to be well versed in Philippine History. I am not a teen ager any more and am only interested in having friendly dialogues and not monologues. "I have been there and done that"
even to the better educated Spaniards (my ancestors are Irish, by way). I taught boxing in the slums of Tondo in 1968-71 as a volunteer for the Amateur Boxing Association of the Philippines under the presidency of Gene Puyat. More impoverished Filipinos you will not find anywhere else. And believe me, there WERE true mestizos among them. Please see one of my blogs on our colonial mentality where I touched on some statistics on ethnicity. I hate going down to this kind of exchange but I am obliging to hopefully satisfy your "demand".